ON JUNE 22, 1941, at 3:15 in the morning, the largest invasion force ever assembled crossed into the Soviet Union from the west to begin Operation Barbarossa. Three million German troops, another half a million soldiers from allied countries such as Hungary and Romania, 3,600 tanks, 600,000 motor vehicles, 7,000 artillery pieces, and 2,700 combat aircraft opened the assault. As bombs rained down on Soviet cities and airfields, the Germans advanced up to 50 kilometers a day, taking the opposing Red Army forces by surprise, killing and capturing huge numbers of Soviet soldiers. Confused and disoriented, the Red Army virtually collapsed. Retreat was made difficult by the Germans’ destruction of roads, railways, and communications behind the Soviet front. By July 3, the Chief of the German Army General Staff was noting in his diary that “the campaign against Russia has been won in 14 days,” a view echoed triumphantly by Adolf Hitler. By July 11, German tanks had broken through to the outskirts of Kiev, capital of the Ukraine. The euphoria in Hitler’s field headquarters was unbounded. Hitler’s long-term aim in this offensive was to conquer a huge area of Eastern Europe, above all the endless agricultural plains of the Ukraine, and use it to produce food that would keep German soldiers and civilians from starving throughout the remainder of the war. In the longer term, the area would be denuded of its existing inhabitants, up to 45 million of whom he intended to kill through starvation and disease, and settled by German farmers. A start was made with the deliberate extermination of prisoners from the Red Army, who were simply penned into barbed-wire enclosures in the open, denied food and medication, and left to rot. Altogether three and a third million of them died in the course of the war, nearly 60 percent of the total Red Army prisoners taken; 300,000 were dead already by the end of 1941, before the German armed forces and war economy administrators began to realize that some of them could be used for forced labor in Germany instead of being indiscriminately murdered. Hitler and the Nazi leadership regarded the Soviet Union as a fragile, artificial entity, consisting of a vast mass of dull peasants oppressed by a small clique of Jewish Communists. One good push and the whole edifice would collapse. As with so many aspects of Nazi ideology, this was so remote from reality that it seems justified to call it a fantasy. In fact the Soviet Union did not collapse. Stalin—who, ironically, was himself deeply anti-Semitic—rallied after an initial moment of panic, and called upon the Soviet people to resist in a famous radio broadcast on July 3. Abandoning for the moment the rhetoric of Soviet Communism, he declared the defense of the motherland against the Germans to be a “Great Patriotic War.” Realizing what fate lay in store for them if they surrendered to the Germans, and conscious of the fact that they would be shot by the Soviet secret police if they showed the slightest sign of hesitation, Stalin’s troops rallied behind their leader. The Germans’ looting of food supplies and destruction of Soviet towns and villages reminded the Soviet soldiers of what they were fighting for. Their families would surely perish if the Germans won. Fresh reserves of men and munitions were available in quantities that the Germans could not even imagine: five million reservists were mobilized within a few days of the invasion, and nearly ten million more were soon preparing to fight. Military equipment was momentarily harder to come by, since Soviet war industries were being relocated out of harm’s way east of the Ural Mountains in an operation of such magnitude and complexity that it could not be completed until the end of November. The restructuring of the Red Army command and the reorientation of battle tactics that Stalin realized were necessary would not be completed until several months had passed. Still, within a few weeks the Red Army had begun to fight back. Well before the end of July, German officers and troops were complaining in their diaries and letters home that the Russians’ will to resist did not seem to have been broken. German troops were exhausted after weeks of rapid forced marches over huge distances and constant combat along the way. Losses amounted to more than 200,000 by the end of the month. The advance began to slow, hampered by stretched communications, poor roads, and the absence of a railway network of the necessary density to transport large quantities of men, fuel, and equipment at speed. (The Germans were forced to rely on horses, of which more than 600,000 were involved in the campaign.) On July 30, the Army Supreme Command ordered a temporary halt to the invasion to recover, regroup, and resupply. The division of the advancing German forces into three Army Groups—North, Center, and South—was partly dictated by the vastness of the terrain to be traversed, and partly by the need to skirt the huge and virtually impenetrable obstacle of the Pripet marshes. But that stratagem, together with the heavy losses it had sustained, and the continual arrival at the front of new Soviet reserves, made it look increasingly less likely that the enemy could be eliminated by the single knockout blow favored by German military theory, going back ultimately to the early nineteenth-century treatise On War by the intellectual Prussian army officer Carl von Clausewitz. While the advance stalled, Hitler and his generals debated what to do next. It had become obvious that the dissipation of German military strength was hampering the drive for victory. The weight of the campaign had to be concentrated into one of the three main Army Groups. The generals favored strengthening the Army Group Center for a rapid advance on Moscow, where they believed the main enemy force to be located. There it could be destroyed, they thought, bringing a Clausewitzian total victory. But Hitler refused. Instead, he strengthened Army Group South, taking away men and resources from Army Group Center in order to make it ready for the assault on Kiev. Still expecting the edifice of Soviet command to collapse, Hitler did not think that the assault on Stalin’s capital city should be the highest military priority. So he stuck to his original plan to concentrate on acquiring the food supplies and industrial resources of the Ukraine. After that, Army Group South would push on towards the Caucasus, with its oilfields, so badly needed by the petrol-starved German tanks, assault guns, and transport vehicles, while Army Group Center would resume the march on Moscow. Overawed by Hitler, whom they held to be the architect of the previous year’s rapid conquest of western Europe, in a situation where many of them had entertained serious doubts about the wisdom of attacking through the Ardennes, the generals felt unable to gainsay their leader. On August 21, 1941, the decision was finally taken, and soon the German forces began to encircle the city, with General Heinz Guderian’s panzers from Army Group Center approaching from the northeast, and Field-Marshal Gerd von Rundstedt moving tanks across the river Dneiper to the south; three weeks later the various German forces joined up. The city was surrounded, with four Soviet armies encircled. Well before this, Chief of the Soviet General Staff Georgi Zhukov had urged the abandonment of the city by the Soviet forces in order to avoid disaster. But Stalin overruled him, and dismissed him from his post. The commander on the spot, Marshal Budennyi, backed Zhukov and was also fired, and then replaced by the more pliant Marshal Timoshenko. The German advance was met with fierce resistance and repeated counter-attacks. “The Russians’ behavior in action is simply incomprehensible,” wrote one German soldier. “They are incredibly stubborn, and refuse to budge even under the most powerful gunfire.” Another German account spoke of the dead bodies of Russian soldiers as a “carpet” stretching for miles. The Soviet troops knew that their only chance of survival lay in breaking through the German lines, and threw themselves at the advancing forces with astonishing recklessness, resulting in “such losses,” as the German account reported, “that one wonders how they can find the courage and the men to keep coming on.” Unwilling to take prisoners, they shot any Germans they managed to capture, often venting their anger, fear, and frustration on them in horrifying acts of vengeance. The Germans replied in kind. On another part of the front, German troops came across the bodies of over a hundred of their comrades, hung by their hands from trees, their feet doused with petrol and set alight, a method of slow killing known among the Germans as “Stalin’s socks.” Following the discovery, four thousand Red Army prisoners of war were summarily shot by German firing squads. Around Kiev, German planes pounded Soviet positions and communications, German panzers and infantry fought their way relentlessly forward, and the Red Army forces were steadily pushed back until the Germans finally took the citadel on the nineteenth of September. The sheer scale of the victory was unprecedented. The Germans calculated that they had taken 665,000 prisoners along with staggering quantities of tanks, guns, and equipment. In his detailed narrative and assessment of the campaign, David Stahel reckons this is an exaggeration or even a propagandistic “manipulation of the facts.” Still, there was no doubting the total defeat of the Red Army. At the end, morale had finally collapsed. One local man, observing a group of captured Red Army soldiers, reported them complaining about Stalin and his henchmen: “They want us to die for them—no, we are not as stupid as they think.” Lice-ridden, hungry, desperate, with rags around their feet replacing broken and worn-out boots, they were susceptible to the blandishments of the Germans, who dropped or posted leaflets or broadcast with loudspeakers across the lines promising bread and cigarettes to anyone who surrendered. So demoralized were the Soviet troops that many gave themselves up in droves, despite the widespread knowledge of what had happened previously to huge numbers of Soviet prisoners of war taken by the Germans. By October 1943, there were only 295,000 people left in Kiev. Scores of thousands had died from malnutrition and associated diseases. “First they finished off the Yids,” people were recorded as saying, “but they … exterminate us every day by the dozen, they’re destroying us in a slow death.” Hitler had originally ordered the city to be razed to the ground, and was reportedly angry that he had been disobeyed; but the slow death of Kiev was in fact the future he had envisaged for all Russian cities in the wake of conquest, to make way some time in the not too distant future for waves of German settlers as the ‘Slav’ population died out. In sheer scale at least, the Battle of Kiev was the greatest German victory of the war. Propaganda Minister Joseph Goebbels lost no time in trumpeting it as a stunning triumph for German arms and a vindication of Hitler’s change of strategy on the Eastern Front. Morale at home, dampened by the slow progress of the German advance over the previous few weeks, improved dramatically, but only because, as the SS reported, many people now expected a collapse of the Soviet regime and the “end of the war against Russia” in four to six weeks. 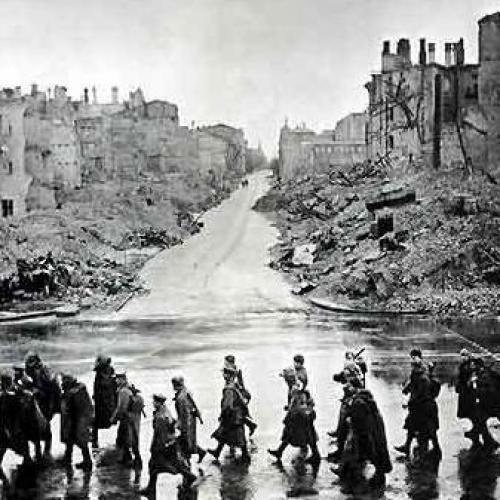 “Kiev,” Stahel concurs, “was uniquely Hitler’s triumph.” His strategy had been bitterly opposed by his senior generals before the event. But he had been aided and abetted by the intransigence of Stalin, whose dismissal of his own senior generals and insistence on defense at all costs made a major contribution to the German victory. The two dictators drew opposite conclusions from the outcome of the battle. Stalin belatedly recognized that it would in the future be wiser to leave matters largely to his generals. Hitler saw his triumph as a vindication of his own strategic genius, brushing his generals aside with ever-growing, ever more thinly veiled contempt. Yet as Stahel notes, the victory was Pyrrhic, the triumph illusory. Immediately after the capture of Kiev, the German forces drove on to Moscow. But it was already too late. Throughout the summer, the paucity of rail links to the combat zone had meant that the Germans had to use dusty, unmade Soviet roads for most of their transports; huge dust clouds rose from the rumbling tanks and lorries and marching columns of men, clogging up engines and making it difficult to breathe. The autumn rains came early in 1941, with rainfall in the Ukraine by September already the worst since 1874. “Such is war on the steppes of the Ukraine,” noted one eyewitness: “dust, mud, dust, mud.” The advance on Moscow was called to a halt for three weeks. Zhukov, the chief of the Soviet General Staff, restored to favor after the vindication of his dire warnings about Kiev, seized the opportunity to bring up fresh reserves and reorganize Moscow’s defenses. By November the onset of winter made the ground hard enough for the Germans to resume their advance. But soon it was snowing, and the German troops, who had not been issued with winter clothing because Hitler and the generals had expected to win the war by the fall, began to suffer frostbite in temperatures as low as minus 40 degrees Celsius; some froze to death. The better equipped Red Army counter-attacked and brought the advance to a halt. The consternation at this defeat caused several German generals to suffer breakdowns or even heart attacks; Hitler took the opportunity to reshape the army command, blaming his officers for the debacle. After the war, the surviving generals riposted by claiming they could have taken Moscow had they not been diverted to Kiev, thus causing a fatal delay of several weeks in the advance. But Zhukov pointed out, not unreasonably, that the existence of several Soviet armies in the Kiev area would have exposed the German flank to attacks that he certainly would have ordered them to undertake on the German forces if they had moved towards Moscow immediately. The weather was not the only problem. Every German victory was bought at a price that the Wehrmacht could ill afford. By the sixteenth of September it had lost almost half a million men since the invasion. In some divisions the casualty rate stood at nearly 17 per cent. Guderian’s Panzer Group 2 had lost a total of 32,000 men. In September alone, during and immediately after the Battle of Kiev, the German forces in the east suffered more than 50,000 fatalities. Replacements took time to train and bring up, and German combat units were already below strength when the battle for Moscow began. This meant that commanders had to ask those who remained to fight and to march even harder than before. Not surprisingly, they became increasingly battle-weary. Growing attacks from Soviet partisans in the rear only added to their woes. The tired, exhausted, lice-ridden, sick, and freezing soldiers who faced Zhukov’s troops before Moscow in December 1941 were very different from the optimistic, dashing troops who had entered the Soviet Union six months before. Just as bad was the strain that the continual fighting, and major operations such as the Battle of Kiev, placed on German supplies. Stukas and other combat aircraft caused considerable damage in the battle, but these planes were being shot down and crews killed or captured all the time. The situation on the ground was if anything even worse. General Model’s Third Panzer Division, beginning the invasion with a force of just under 200 tanks, had only ten in operation by the middle of September. As Guderian concluded, “These figures show how badly the troops needed a rest and a period for maintenance.” The bad weather made it difficult to bring up spare parts and fuel to the front. German war production and recruitment could not keep pace with losses on this scale over a long period. By contrast, the Soviet economy was outperforming the German in every respect, producing twice the number of combat aircraft and three times the number of tanks. At the beginning of February 1942, Hitler’s Minister of Armaments Fritz Todt was warning that Germany could not hope to keep pace even with the Soviet Union, let alone with the British Empire and the United States as well. Each of these three enemy powers was out-producing Germany on its own: together their economic strength was unmatchable. The Soviet Union’s resources in manpower were virtually inexhaustible, especially once the bombing of Pearl Harbor and its aftermath focused the attention of the Japanese on the war with the United States and thus allowed Stalin to bring huge reinforcements across from the Pacific theater to engage in the defense of Moscow. The year 1942 would see further German victories, but they were to be short-lived. The writing was already on the wall. Indeed, Stahel argues, it had already been there at the beginning of August, when Operation Barbarossa had been brought to its first temporary halt. The whole campaign depended on a quick victory, bringing the Soviet Union to its knees in a few weeks, just as had happened with Germany’s swift victories in the west, over France, Belgium, Holland, Denmark, and Norway the previous year. But the blitzkrieg tactics that had worked by pinning up Germany’s western enemies against the North Sea and the English Channel could not work in the limitless expanse of the Eastern European steppe. Small and medium-sized west European powers were one thing; conquering the might of the Soviet Union, increasingly helped by supplies convoyed from the United States, was an entirely different proposition. The story of the Battle of Kiev has been told many times, but seldom in such detail as it is in David Stahel’s book. Relying mainly on German sources, he brings new evidence to bear on the conflict with the official war diaries of German divisions, as well as making good use of published editions of the private field-post letters and diaries of German soldiers of all ranks. This is emphatically a military history, replete with complex (and not always easily decipherable) maps of troop movements and dispositions, technical terms, titles and abbreviations, and full names for all the troop units involved. Some of this impedes readability (particularly irritating is the use of Roman numerals, as in “the XXXXVII Panzer Corps”), but overall Stahel conveys extremely complex military action with exemplary clarity. Unlike more traditional military historians, Stahel is acutely aware of the wider context of the action, from Hitler’s overall aims for the war to the importance of logistics for the outcome; from the murderous racism and ruthless pragmatism with which the German leaders, military as well as political, condemned so many Soviet civilians to starve and so many Jewish inhabitants to terrible death, to the postwar disputes among historians and retired generals over Hitler’s strategy; from the conditions troops had to face in the Ukrainian and Russian autumn and winter to the basic realities of the economic foundations of the German war effort, foundations which, he argues convincingly if not entirely originally, were starting to crumble almost from the moment when Operation Barbarossa was launched. Richard Evans is Regius Professor of History and President of Wolfson College at Cambridge University, and author of The Third Reich at War, published by the Penguin Press in 2009.